Just days before he is sworn as the next president, Barack Obama can be had - for a price. From buttons and baby shirts to books and bobbleheads, the president-elect's likeness is for sale on virtually every street in the nation's capital. But some local residents have joined the entrepreneurial fray in a decidedly District way. Kristina Bilonick, a visual artist and native Washingtonian, is hawking "D.C. Welcome Wagon" posters. One features Michelle Obama holding a microphone, but the message is not exactly celebratory: "Michelle rocks the mic ... D.C. has no mic." Bilonick is among a group of local residents who are using inaugural week as a platform to make the case for D.C. statehood and voting rights. Despite paying taxes for two centuries, residents of the nation's capital have no voting representative in Congress. The city has fought back, symbolically and politically. In 2000, just before Bill Clinton left office, the District's DMV began issuing "Taxation Without Representation" license plates. In 2007, lawmakers cut a deal to give the heavily Democratic city a representative on Capitol Hill; in exchange, GOP-leaning Utah was offered an extra Congress member. But Republicans killed the measure. Now that a Democrat is poised to return to the White House, locals are cautiously optimistic - and actively vocal. "There's a vibe. Everyone's like 'we can do it,'" says Bilonick, who, along with a team of designers, posted a variety of "Hear Our Voice" posters around the city. Today she is selling them (for $5 each) and other items at an "Obama-bilia" brunch at Wonderland, a bar on 11th Street. Two vending tables down from Bilonick is Tim Gibbon, an artist and activist who moved to Washington five years ago. Specializing in "D.C. pride" themes, Gibbon is selling a pro-statehood postcard ($3) and hopes that the president-elect will be receptive to his home town's rallying cry. "Hopefully under Obama's administration, something will happen," he says. 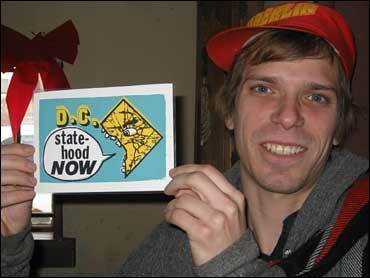 "D.C.'s really disenfranchised in a way. We don't have full control of our city." Still, most of these artists-turned-entrepreneurs remain more focused on creativity than politics. Bilonick concedes she's not sure how much influence Mr. Obama would have in the D.C. statehood debate. But she is sure of one thing: "Michelle Obama is a rock star." Which explains her hottest selling item - a $20 t-shirt featuring the soon-to-be first lady emblazoned with two words: "The Rock." Meanwhile, fellow vendor Aaron Plantenberg is selling a Barack Obama inauguration soccer scarf. Some of the proceeds from the $20 item are going to the campaign for D.C. statehood, but the vendor admits part of his motive is "private gain." Plantenberg, a Spanish teacher who has already sold more than 300 scarves, says that the arctic weather has boosted his bottom line. "I hoped it would be cold," he admits. "But I didn't think it would be this cold." By CBSNews.com producer Stephen Smith.